Before the 1991 Super Bowl, Bill Belichick told his Giants defense to let Buffalo running back Thurman Thomas rush for 100 yards. As David Halberstam writes in Education of a Coach, it was a tough sell. The New York Giants played a physical defense that prided itself on not allowing 100 yard rushers. Just in case his players didn’t listen, Belichick took it upon himself to ensure Thomas got his yards. He took out a defensive lineman and linebacker and replaced those large bodies with two defensive backs. In football lingo, the Giants played a 2-3-6 defense designed to struggle against the run. To examine Belichick’s strategy, let’s use analytics to evaluate the importance of rushing compared to passing in the NFL. To make this comparison, we must move past misleading statistics like rush yards per game. Teams with the lead run the ball to take time off the clock. Any team can rush for 100 yards if they run it 50 times. To measure true skill, let’s consider yards per attempt, a powerful efficiency metric. A team can’t fake their way to 5 yards per carry by running the ball more. In the NFL, I’ll define team efficiency for passing and rushing as yards gained per attempt on offense minus yards allowed per attempt on defense. Better offenses gain more yards per attempt. However, better defenses allow fewer yards per attempt, so subtracting these smaller values leads to higher team efficiency. Team efficiency can come from the offense, defense, or both. For example, consider Carolina in 2015, the season they played in the Super Bowl. The offense gained 6.2 yards per attempt, 13th best in the NFL. This rank might seem low given that quarterback Cam Newton won Most Valuable Player award that season. The defense allowed 5.0 yards per attempt, 2nd best. This gives a team pass efficiency of 1.2 yards per attempt, 5th in the NFL. In these numbers, sacks count as pass attempts. These negative yards count against the yards per attempt for an offense. In rush efficiency, the value comes directly from yards per carry. To examine the relative importance of passing versus rushing, let’s look at how playoff and Super Bowl winning teams performed in team efficiency. Strong teams in passing and rushing will have positive efficiency values, or better than the NFL average of zero. NFL playoff teams excel in passing, either by throwing the ball on offense, preventing the pass on defense, or both. From 1998 through 2017, only 39 of 252 playoff teams allowed more yards per pass attempt than they gained. This implies that 84.5% of playoff teams had a positive pass efficiency. Super Bowl champions excelled in pass efficiency as well, as 15 of the 21 champions had pass efficiencies of a yard per attempt or more. However, excellence in the air does not guarantee success in the small sample size of the playoffs. Three Super Bowl champions had negative pass efficiency during the regular season. Let’s look more closely at two of these Super Bowls. After the 2007 season, the New York Giants beat New England, a team with Tom Brady and Randy Moss looking for an undefeated season. After the 2001 season, New England beat St. Louis, the Greatest Show on Turf led by Kurt Warner and Marshall Faulk. These are considered two of the greatest Super Bowl upsets ever. The importance of the passing game in the NFL should not be a surprise. Quarterbacks dominate the headlines and earn the highest salaries. With the importance of throwing the ball on offense, it makes sense that teams with a strong pass defense also excel. However, the insignificance of rushing in the NFL might surprise you. From 1997 through 2017, only 57.5% of playoff teams (145 of 252) had a positive team rush efficiency. The visual of rush efficiency for playoff teams shows a random scatter of points with both positive and negative values. A strong run game or stout rush defense has little effect in helping an NFL team win enough games to make the playoffs. Moreover, running the football doesn’t suddenly become important in the playoffs. If it did, the teams with positive values of team rush efficiency would make the Super Bowl. Instead, only 26 of 42 Super Bowl teams from 1997 through 2017 had a positive rush efficiency value, a rate of 61.9%. For example, Indianapolis won the Super Bowl after the 2006 season despite having the NFL’s worst team rush efficiency during the regular season. Green Bay ranked 31st out of 32 teams in rush efficiency during the 2010 regular season, but the Packers won the Super Bowl anyway. These teams had elite quarterbacks, as Peyton Manning of Indianapolis and Aaron Rodgers for Green Bay propelled these teams to regular and post season success. We’ll get back to these two later when we explore whether a team needs a run game to throw the ball effectively. These raw yards per carry numbers can get skewed a bit. Teams that excel in pass efficiency will tend to have the lead late in games. In these situations, they will run the ball more to take time off the clock. The defense expects the run, which should hinder their rush efficiency. From 2012 through 2016, teams up 7 or more points in the fourth quarter rushed for 3.29 yards per carry, well below the NFL average of 4.18. While this certainly hurts the rush efficiency of good teams, these carries only make up 12.0% of all carries during this period. Teams down 7 or more points in the fourth quarter rush for 4.91 yards per carry, so these bad teams get a bump in rush efficiency. However, these carries only make up 5.1% of all NFL carries, as these teams opt to throw the ball as the best means to get back into the game. Excluding these carries would not change the main claim about the insignificance of rushing in the NFL. Hope you’re enjoying the article so far. You have a ways to go, as we haven’t even discussed whether you need the run to set up play action. If you sign up for my free email newsletter, I’ll send a paper copy of this manifesto to read at your leisure. You’ll also get a weekly sample of football predictions usually reserved for paying members of the site. In the NFL, running the ball does not affect winning as much as you think. To illustrate this point, consider this guessing game. Suppose you want to guess how many games a team will win during the regular season. Without any other data, it makes sense to guess 8, the average number of wins in a 16 game season. From 1997 through 2016, this estimate would be wrong by 3.08 wins. In technical jargon, 3.08 is the standard deviation of actual wins from the guess of 8. In normal people language, this means 2 of 3 teams will be within 3.08 wins of the guess. About two thirds of NFL teams won between 5 and 11 games between 1997 and 2016. How much better does your guess get knowing the rush efficiency for each team? To determine the correction, you plot wins as a function of team rush efficiency and draw a best fit line through the data. The bottom panel of the visual shows this relationship for all NFL teams from 1997 through 2016. The regression line informs a new guess about the number of games a team will win. For example, suppose a team has a rush efficiency of 0.6 yards per carry. Instead of guessing 8 wins for this team, the line shows 8.7 wins for this team. How much better are these new guesses? Not much. The error only drops from 3.08 wins to 3.01 wins. In technical jargon, rush efficiency explains only 5.0% of the variance in wins. (For a simple, visual explanation of the previous statement, click here.) You might as well guess at random. The results of the guessing game get better with team pass efficiency, as the visual shows that better passing teams tend to win more games. The error in estimating wins drops from 3.08 to 1.95. 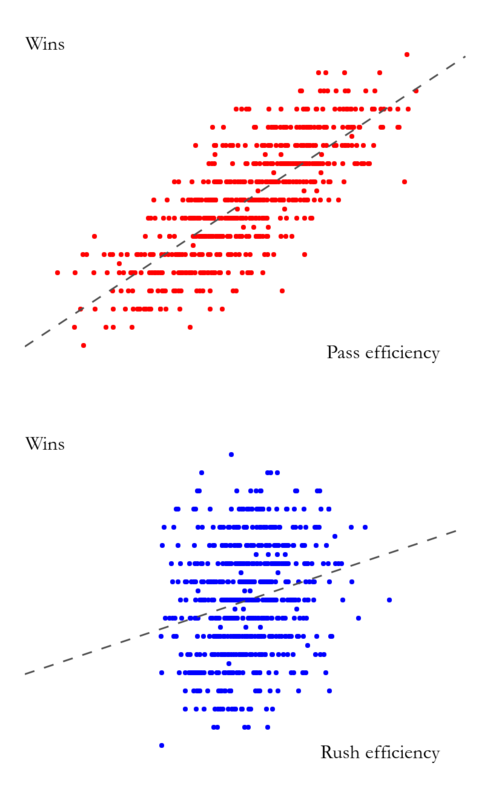 Pass efficiency explains 60.2% of the variance in wins in the NFL. 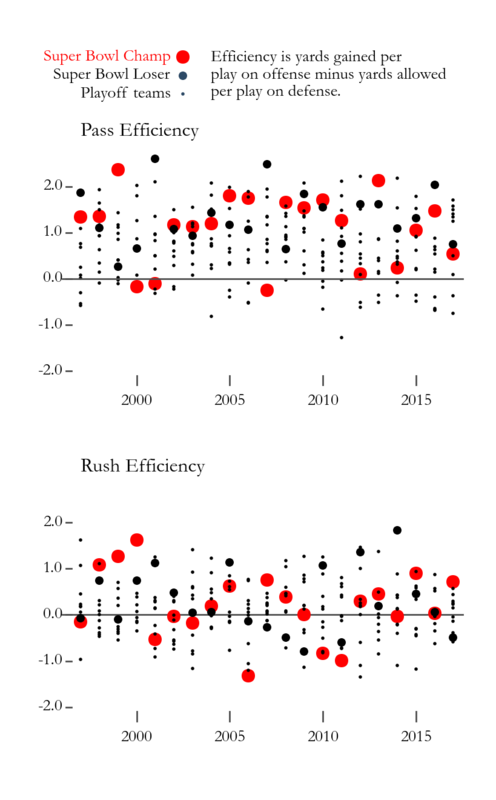 In college football, rush efficiency correlates more strongly with wins than in the NFL. Teams like Alabama, Stanford and Wisconsin have won with a power running game and a physical front seven on defense. This level of insignificance in the rushing game is unique to the NFL. To put these numbers in context, let’s look at two NFL franchises and how their fate depended on the efficiency with which they threw or ran the ball. Indianapolis had a remarkable run from 2003 through 2010. Under the leadership of General Manager Bill Polian and quarterback Peyton Manning, the Colts won at least 12 games each year before slacking off with 10 wins in 2010. The Colts achieved success through the air, ranking in the top 8 in team pass efficiency each year. Peyton Manning and his offense played the bigger role, but the pass defense helped out some years. The Colts ranked in the top 10 in yards allowed per pass attempt from 2007 through 2009. However, Indianapolis was really bad in the run game. Only once in this era (2007) did they gain more yards per carry than they allowed. In 2006, they had the worst team rush efficiency in the NFL, as their rush defense allowed a league worst 5.3 yards per carry. The rush defense performed better in the playoffs, as they allowed a near NFL average 4.1 yards per carry. However, Manning and the pass offense led Indianapolis to their Super Bowl win that year over Chicago. In contrast to Indianapolis, Minnesota dominated the ground game during this same period. They featured running back Adrian Peterson on offense and had tackles Pat and Kevin Williams clogging up the middle on defense. From 2006 through 2013, Minnesota finished 1st in rush efficiency four times and 3rd another two times. However, this strength led to ups and downs in wins. Minnesota went 3-13 in 2011 despite leading the NFL in rush efficiency. The next season, they led the NFL again behind a monster season from Peterson, who made a remarkable return from knee surgery. The Vikings had a 10-6 record that season. The Viking’s best season over this stretch came in 2009. They finished 12th in rush efficiency that season, by far their worst rank. The difference? A quarterback named Brett Farve came out of retirement to play for Minnesota. The Vikings finished 7th in yards gained per pass attempt, went 12-4 and came within a late turnover against New Orleans of playing in the Super Bowl. While these two franchises represent the extremes, the trend is clear. In the modern NFL, teams that can throw the ball and defend the pass win football games and championships. It matters little whether they can run the ball or stop the run. Will this trend continue into the future? Will the NFL continue to prize the quarterback, cornerbacks and pass rushers? Or will running backs make a come back soon? To guess at the future, we first need to look at the past and the evolution of the passing game. In the late 1960’s, Cincinnati’s offensive coordinator Bill Walsh had a problem: his players sucked. As Michael Lewis describes in his book Blindside, the quarterback couldn’t throw the ball more than 20 yards down the field. The receivers defined the term “replacement level.” They may have struggled in a flag football game. With this lack of talent, Walsh had to innovate. Instead of a deep passing game that required a strong armed quarterback and fast receivers, he developed a passing game based on short drop backs by the quarterback and well-timed passes to the receivers. The ball traveled a shorter distance in the air, making an interception less likely. If the quarterback could hit the receiver in stride, the offense might gain as many yards after the catch as in the air before it. Walsh got many of these ideas from San Diego offensive coordinator Sid Gilman, but he put his own spin on the West Coast offense. Soon, he coaxed quarterback Virgil Carter into leading the NFL in completion percentage in 1971. Then Walsh made a pleasant discovery. This West Coast offense didn’t just work when your players sucked. It kept moving the ball efficiently with better players. Cincinnati made the AFC championship game in 1975 with Kenny Anderson at quarterback. By the time Walsh became the San Francisco head coach in 1979, the NFL had tipped the rules in favor of the passing game. Offensive lineman could now use their hands when blocking, which made it easier to protect the quarterback. Defensive backs could now put their hands on a receiver only within 5 yards of the line of scrimmage instead of everywhere on the field. Walsh thrived in San Francisco during the 1980’s. His teams won three Super Bowls based on his high powered aerial attack. With this success, the rest of the NFL began to adopt the West Coast offense and throw the ball more. The fraction of pass plays rose drastically after 1978 and then continued to rise to 55% by the end of the 1980’s. This infatuation with the pass offense has only accelerated since the turn of the century. By 2016, the fraction of pass plays has reached almost 60%, as the NFL no longer has many blocking tight ends or full backs. With all of these pass plays, one might expect the efficiency of these plays to decrease. The defense begins to take away the passing game, making it easier for the offense to run the ball. However, the exact opposite has happened. Yards per pass attempt, a number that includes the negative yardage from sacks, increased drastically after the 1978 rule changes. This pass efficiency has continued to increase after the turn of the century despite an increasing fraction of pass plays. In contrast, the NFL run game has seen only small gains in efficiency. While the NFL averaged about 4 yards per carry in the 1980s, ball carriers now squeak out 4.18 yards per carry from 2012 through 2016. 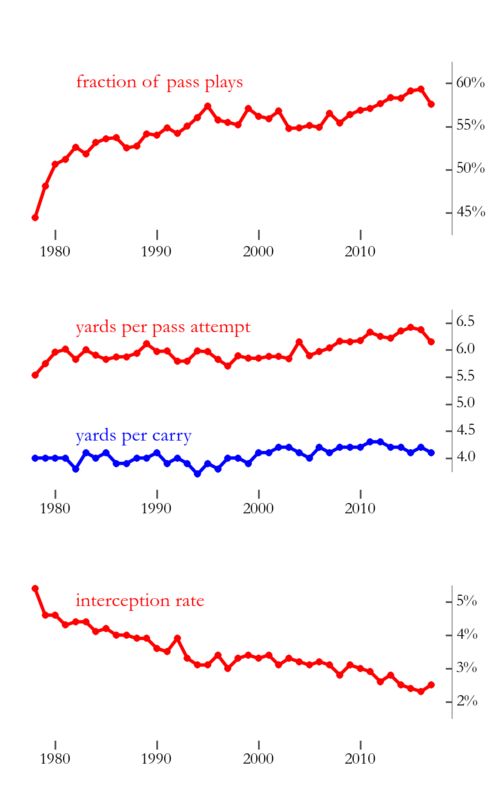 Not only has the pass game become more efficient, it has also become safer. In the 1970’s, more than 5% of pass attempts ended in the hands of the defense. But with the adoption of the short passing game, the interception rate has dropped in a linear fashion and reached a new low of 2.2% in 2016. The passing game is the gift that keeps on giving in the NFL. The increases in efficiency and safety despite an increasing fraction of pass plays suggest that the pass game will continue to dominate the NFL. So let’s take this idea to its logical extreme. Should NFL teams throw on every down? To understand whether teams should throw on every down, let’s ask a question first proposed by Grantland writer Robert Mays in 2013: what is the NFL’s most efficient play? To determine the answer, Mays consulted the ESPN analytics group. They perform calculations that determine the value of each play through the idea of expected points added (EPA). This concept puts the result of a play in context; a 2 yard gain means more on 3rd and 1 than 1st and 10. Expected points added (EPA) is the expected points gained or lost from a play. For example, a team starts with 1st and 10 at its own 20 yard line, which has an expected points of 0.3. Let’s say they gain 20 yards on first down. The resulting 1st and 10 from the 40 has an expected points of 1.3. Hence, the 20 yard gain results in a EPA of 1.0. Mays had the ESPN analytics group look at the EPA for different types of plays. As a baseline, they first looked at rush plays based on data from the 2009 through 2013 seasons. On average, a rush play earns -0.04 EPA. In case you missed the negative sign in front of that number, the average run play in the NFL loses points for the offense. That might be the biggest indictment of running the ball in the NFL yet. First, the efficiency of run game by yards per carry has stagnated since the late 1970’s. With a closer inspection of run plays based on EPA, the average run play hurts a team in its quest to score more points than the other team. During the 5 year period of the study, only 4 of 32 NFL teams averaged a positive EPA on run plays. In contrast, the average pass played earned a team +0.04 EPA. Throwing the ball moves a team in the right direction to score more points than the opponent. A certain type of pass play does much better than the typical. The play action pass nets the offense +0.17 EPA. The deception of play action, a play in which the quarterback fakes a hand off before throwing down field, leads to a staggering increase in the point value of the play. Should a team throw the ball on every play? No, since the lack of run plays kills the deception necessary for play action. Throwing on every down makes the offense predictable. However, the study also found that a team doesn’t need to run the ball effectively to make play action work. Remember those 4 teams that had a positive EPA on run plays over the 5 seasons of the study? Only one of them had a top 10 EPA for play action. This team (New England) had a quarterback named Tom Brady. During this period, Adrian Peterson of the Minnesota Vikings was the most dominant running back in the NFL. However, Minnesota never excelled at play action. The Vikings ranked 21st in EPA on play action. In 2013, Buffalo led the NFL in rush attempts but ranked last in EPA on play action. The analytics suggest that a team doesn’t have to run the ball well to excel at play action. Despite the inherent deception, play action is a pass play whose success relies on a accurate pass down the field. A team needs a good quarterback to make that pass. In the study, the top play action teams (New England, Green Bay, Pittsburgh) had elite quarterbacks (Tom Brady, Aaron Rodgers, Ben Roethlisberger, respectively). Even in showing that teams need to run the ball, we run into the insignificance of running the ball well. But, as Halberstam discusses in Education of a Coach, Belichick did want the Bills to pick up small gains on the ground if it meant keeping Jim Kelly from throwing the ball. He understood that rushing means little to winning in the NFL. Each year, the significance of the passing game in the NFL becomes more apparent. Teams offer huge contracts to cornerbacks like Patrick Peterson while future Hall of Fame running backs like Adrian Peterson wait for a free agent deal. Teams also now look to the NFL draft to fill needs in the running game. They can draft a running back good enough to crank out 4 yards per carry behind a decent offensive line. He doesn’t cost much on a rookie contract, leaving salary cap resources for the pass game on offense and defense. The insignificance of the run game should also impact NFL handicapping. You have limited time to evaluate injuries, so focus on those that affect the passing game. The quarterback is an obvious adjustment, and an injury to a top receiver matters too. But cornerbacks do not get the same attention even though they might be the NFL’s most difficult players to replace.